Guide to Lancaster County, Pennsylvania ancestry, family history and genealogy in courthouse sources including birth records, marriage records, death records, census records, wills, deeds and land records, Civil War records, Revolutionary War records, family histories, cemeteries, churches, tax records, newspapers, and obituaries. Location of Pennsylvania in the U.S.
Statewide registration for births and deaths began in 1906. General compliance by 1915. Many Scotch-Irish immigrants settled in Lancaster County in the early eighteenth century. The area was predominantly a German place of settlement. The county was named for Lancaster, Lancashire. It's county seat is Lancaster and was founded May 10, 1729. It is located in the Southeast area of the state. 14 October 1749: York County set off. 14 October 1751: Berks County set off. 27 January 1750: Cumberland County set off. 21 March 1772: Northumberland County set off. 16 October 1813: Lebanon County set off. For animated maps illustrating Pennsylvania county boundary changes, "Rotating Formation Pennsylvania County Boundary Maps" (1673-1878) may be viewed for free at the MapofUS.org website. See Pennsylvania Cemeteries for more information. The LDS Family History Library has a number of cemetery records in books and on films. They would be available either in the Family History Library in Salt Lake City or in one of its affiliate Family History Centers. For tips on accessing Lancaster County, Pennsylvania Genealogy Federal (or United States) census records online, see: Pennsylvania Census. There are no county or state census records available for Pennsylvania. County and city tax records can be used as a substitute when census records are not available. 1708-1985 Pennsylvania, Church and Town Records, 1708-1985 at Historical Society of Pennsylvania – $, free to members of the society; Also available at Ancestry.com – $; 7,542,774 entries. This database is incomplete for all counties. 1729-1881 Pennsylvania Church Records - Adams, Berks, and Lancaster Counties, 1729-1881 at Ancestry.com – $; details on 180,000 church-goers from 50 churches; incomplete. 1723-1800 Humphrey, John T. Pennsylvania Births, Lancaster County, 1723-1800. 2 vols. Washington, D.C.: Humphrey Publications, 1997. FHL Book 974.815 K2h. Contains records from the following churches: Sadsbury Monthly Meeting, Sadsbury Township; Little Britain Monthly Meeting, Little Britain Township; St. James' Protestant Episcopal Church, Lancaster; Muddy Creek Lutheran Church, East Cocalico Township; Emanuel Lutheran Church, Elizabeth Township, also called Old Warwick Lutheran Church; Holy Trinity Lutheran Church, Lancaster; Moravian Church, Lancaster; First Reformed Church, Lancaster; Trinity Lutheran Church, New Holland; St. Mary's Roman Catholic Church, Lancaster; Zion Lutheran Church, Manheim; Muddy Creek Reformed Church, East Cocalico Township; Bangor Protestant Episcopal Church, Caenarfon [sic] Township; Bergstrasse Lutheran Church, Ephrata Township; Records of Rev. John Waldschmidt; Records of Rev. John Cuthbertson; Records of Rev. Traugott Frederick Illing; Christ Lutheran Church, Elizabethtown; St. Michael's Lutheran Church, Strasburg; Swamp Reformed Church, West Cocalico Township; Zion Reformed Church, Elizabeth Township, also known as Reyer's Reformed Church; Blasser Reformed Church, West Donegal Township; White Oak Lutheran and Reformed churches, Penn Township; Zeltenreich/Seltenreich Reformed Church, Earl Township; Maytown Reformed Church, East Donegal Township; St. Paul's Reformed Church, Manheim; Pequea Reformed, Strasburg Township; Maytown Lutheran Church, East Donegal Township; Cocalico Reformed Church, Ephrata; Records of Rev. John Casper Stoever, Jr.; Moravian Church, Lititz. Lancaster County USGenWeb Project This site has several listings of online Lancaster County church records. Lancaster County had one of the largest Mennonite and Amish populations in Pennsylvania in the 1800s. 1787-1804 St. Mary's Catholic Church, Lancaster, PA Marriages, Baptisms, Burials 1787-1804 at PAGenWeb - free. Church of the Brethren Network includes Conestoga Congregation Baptisms 1739-1747 and Conestoga Congregation Baptisms 1748-1769. The Blue Ridge District of the Eastern States Mission comprised church members living in southeastern Pennsylvania. District headquarters were in Lancaster, with branches located in Bucks, Fulton, Lancaster, and York counties. 1728-1853 Sachse, Julius F. "The Registers of the Ephrata Community," The Pennsylvania Magazine of History and Biography, Burials 1728-1853: Vol. 14 (1890):297-312, Burials 1730s-1813: 387-402. For free online access, see WeRelate. Also available on the Church of the Brethren Network website. 1755-1759 Private Marriage Register of Rev. Thomas Barton, in York County, Pennsylvania in "Private Church Registers to 1800, York County, Pennsylvania" at Ancestry ($). 1755-1756, 1783-1796 St. James Church, Lancaster, Baptism Index 1755-1756 and 1783-1796 in International Genealogical Index at FamilySearch - free. Batch C507311. Registers are lost, but some parishioners appear in the registers of St. James's Church, Lancaster. Registers are lost, but some parishioners appear in the registers of St. James's Church, Lancaster. An old trunk was discovered at Bangor Church with "sundry account-books and ancient title-deeds." 1852-1877 Salem Church of the Evangelical Association, Lancaster, Marriage Index 1852-1877 in International Genealogical Index at FamilySearch - free. Batch M526051. 1875-1885 Trinity Church, Lititz, Marriage Index 1875-1885 in International Genealogical Index at FamilySearch - free. Batch M526421. Weiser, Frederick Sheely. Parochial Registers for Lutheran Congregations in Lancaster County, Pennsylvania, 1729-1960: A Guide to Genealogical Resources in the Parish Records of Baptisms, Marriages, and Burials, As Well As to Translations and Copies in Print in Public Institutions. Lancaster, Pa.: unknown, 1961. Digital version at Ancestry ($). Book: Records of Rev. John Casper Stoever, Baptismal and Marriage, 1730-1779. (Harrisburg, PA: Harrisburg Pub.,1896). Digital version: Internet Archive. - Marriage Records of Rev. John Casper Stoever with all 1,429 marriages compiled by Mildred Smith (Lancaster County Genealogy Project). 1729-1777 Augustus Evangelical Lutheran Church, New Providence, Baptism Index 1729-1777 in International Genealogical Index at FamilySearch - free. Batch C536541. 1742-1875 Bergstrasse Evangelical Lutheran Church, Ephrata Township, Baptism Index 1742-1875 in International Genealogical Index at FamilySearch - free. Batches C504171 and C536481. 1779-1885 Christ Evangelical Lutheran Church, Elizabethtown, Marriage Index 1779-1885 in International Genealogical Index at FamilySearch - free. Batches M504361, M536481, and M504361. 1729-1742 Cocalico Evangelisch Luttnusche, Baptism Index 1729-1742 in International Genealogical Index at FamilySearch - free. Batch C536711. 1868-1967 Evangelical Church, Lutheran County, Marriage Index 1868-1967 in International Genealogical Index at FamilySearch - free. Batch M526301. 1833-1853 Evangelical Lutheran Congregation, Mount Joy, Baptism Index 1833-1853 in International Genealogical Index at FamilySearch - free. Batch C504471. 1748-1766 Holy Trinity Evangelical Lutheran Church Marriage Index 1748-1766 in International Genealogical Index at FamilySearch - free. Batch M536501. 1808-1875 Swamp Lutheran Church, Reinholds, Baptism Index 1808-1875 in International Genealogical Index at FamilySearch - free. Batch C504521. 1730-1799 Trinity Evangelical Lutheran Church, New Holland, Death Index 1730-1799 in International Genealogical Index at FamilySearch - free. Batches B536511 and B000451. 1754-1789 White Oaks Lutheran and Reformed Church, Penn Township, Baptism Index 1754-1789 in International Genealogical Index at FamilySearch - free. Batch C727041. 1771-1782, 1807-1812 - Zion Evangelical Lutheran Church, Manheim, Marriage Index 1771-1782 and 1807-1812 in International Genealogical Index at FamilySearch - free. Batch M504231. The first Scotch-Irish settlement in Lancaster County was made at Chickies Creek in 1714. Donegal Presbyterian Church was built there shortly thereafter. Pequea Presbyterian Church, constructed at another early Scotch-Irish settlement, was built in 1724. Paxtang Church and Derry Church were both organized in 1729. 1741-1810 Marriage Record of Paxtang and Derry Churches, 1741-1810 (Pennsylvania Archives, Series 2, Vol. 8, Part 10) at Ancestry ($); Google Books - free. The Hanover Presbyterian Church was built in 1736 in a Scotch-Irish settlement. This ground later fell within the bounds of Dauphin County and still later Lebanon County after those counties split off. 1843-1890 Cedar Grove Presbyterian Church, East Earl, Marriage Index 1843-1890 in International Genealogical Index at FamilySearch - free. Batch M727431. 1808-1821, 1846-1859 Middle Octorara Presbyterian Church, Quarryville, Baptism Index 1808-1821 and 1846-1859 in International Genealogical Index at FamilySearch - free. Batches C534991 and C534992. 1766-1779 Seltenreich Presbyterian Church Marriage Index 1766-1779 in International Genealogical Index at FamilySearch - free. Batch M523711. 1800s-1900s Pennsylvania Quaker Records: Warrington, York County, Little Brittain, Lancaster County, Centre, Centre County, West Branch, Clearfield County, Dunnings Creek, Bedford County. n.p. Digital versions at Ancestry ($); Internet Archive - free. 1736-1800 First Reformed Church, Lancaster, Baptism Index 1736-1800 in International Genealogical Index at FamilySearch - free. Batch C511421. 1767-1779 Keller's Reformed Church, Cocalico, Marriage Index 1767-1779 in International Genealogical Index at FamilySearch - free. Batch M536681. 1766-1779 Muddy Creek Reformed Church, East Cocalico Township, Marriage Index 1766-1779 in International Genealogical Index at FamilySearch - free. Batch M516471. 1753 Reformed Church of Cocalico, Marriage Index 1753 in International Genealogical Index at FamilySearch - free. Batch M536701. 1774-1819 - Transcript of baptismal record of the Reformed Church of Maytown, Lancaster County, 1765 (1774)-1819. Typescript held at the Franklin and Marshall College, Lancaster, Pennsylvania. Digital version at Ancestry ($). 1823-1843 Reihers or Zion's Reformed Church, Brickerville, Marriage Index 1823-1843 in International Genealogical Index at FamilySearch - free. Batch M516571. 1767-1779 Zion's Reformed Church, Brickerville, Marriage Index 1767-1779 in International Genealogical Index at FamilySearch - free. Batch M536671. 1770-1792 St. Mary's Roman Catholic Church Baptism Index 1770-1792 in International Genealogical Index at FamilySearch - free. Batch C507321. Lancaster County, Pennsylvania Genealogy court records are housed at the Lancaster County, Pennsylvania Genealogy Courthouse. For many counties copies of court records may be found at the Pennsylvania State Archives and in the FamilySearch collection. Note that within these collections some films may contain the same records, but have different titles. Other titles are not duplicates. See Finding Court Records at other repositories within this section for links to the online catalogs for these two collections. Films at the Pennsylvania State Archives are not available for inter-library loan. If court records are available FamilySearch films may be available at a local Family History Center. Call ahead for availability. The Courts of Common Pleas are the trial courts of Pennsylvania. Major civil and criminal cases are heard in these courts. Judges also decide cases involving adoption, divorce, child custody, abuse, juvenile delinquency, estates, guardianships, charitable organizations and many other matters. The Common Pleas courts are organized into 60 judicial districts. Lancaster County has its own judicial district. Judges of the Common Pleas courts are elected to 10-year terms. A president judge and a court administrator serve in each judicial district. The Clerk of Courts prepares and maintains the records for the Criminal Division of the Court of Common Pleas. The Clerk signs and affixes the Seal of the Courts to all writs and processes, administers oaths and affirmations, and assumes custody of the seal and records of the Courts. The Clerk certifies and distributes orders of the Court. The Clerk also certifies and prepares bills of costs for the defendants and utilizes the computerized financial management system to disburse fines, costs and restitution. For the Lancaster County, Pennsylvania Genealogy Clerk of Courts address see the Courthouse section on this page. The office of the Prothonotary is the custodian of all civil matters in the county. This includes naturalization, immigration, equity actions, judgements, federal and local tax liens, city liens, family court, arbitrations, license suspension appeals, appeals to higher court, commercial code filings, applications for passports and divorce proceedings. See the Courthouse section on this page for the Lancaster County, Pennsylvania Genealogy Prothonotary office information. The Orphans' Court is responsible for a wide range of matters. The name of the Court is derived from the more general definition of "orphan," that being a person or thing that is without protective affiliation or sponsorship. This would include those not capable of handling their own affairs, minors, incapacitated persons, decedents estates, nonprofit corporations and trusts. It is the role of the Court to ensure that the best interests of the person or entity are not compromised. It is believed the name of this court was borrowed from the Court of Orphans of the city of London, England which had the care and guardianship of children of deceased citizens, in their minority. For Lancaster County, Pennsylvania Genealogy Orphans' Court contact information see the Courthouse section on this page. In Lancaster County the Register of Wills and the Clerk of the Orphans' Court are the same individual. The only birth records stored in Lancaster County are dated from 1881 to 1906. For information about emigration into Pennsylvania, see the Pennsylvania Emigration and Immigration page. Shirk, Willis L., Jr. "Assimilating into the Amerian Milieu: French Huguenots in Eighteenth Century Lancaster County", Lancaster Historical Society Journal, 95:3, 74. Lancaster County USGenWeb Project This site has several online histories of Lancaster County. Land records in Lancaster County began in 1728. These records are filed with the Recorder of Deeds office in Lancaster, Pennsylvania. Land and property records can place an ancestor in a particular location, provide economic information, and reveal family relationships. Land records include: deeds, abstracts, indexes, mortgages, leases, grants, sheriff sales, land patents, and maps. Property records include liens as well as livestock brands and estray records. 1729–present The Recorder of Deeds has placed all county land records on-line which can be viewed for free. Land Records from 1981 to present can be viewed and searched; you do not have to be a registered user, just login as Guest. Land Records from 1729 to 1981 can be viewed but not searched so have the Page number and the Land Record number (Book and Volume for older records). 1729-1770 Mayhill, R.,Lancaster County, Pennsylvania, deed abstracts and Revolutionary War oaths of allegiance: deed books "A" through "M", 1729 through ca.1770. Everyname (incl adj landowners) index. Note that the "Maps" section below also includes maps related to land ownership. See Pennsylvania Land and Property for more information about using land records, especially about original land warrants, surveys, and patents filed at the state land office. Ancestor Tracks has posted free, downloadable images from the Bridgens' Atlas of Lancaster County, Pennsylvania from Actual Surveys by H.F. Bridgens published by D.S. Bare in 1864. This atlas shows major landowners and geographic sites at the date of publishing. While the physical maps are in the public domain, the images we have taken of the maps belong to us and are not to be used commercially. We hereby give permission to use them strictly for personal use; please attribute to Ancestor Tracks. An Atlas of Township Warrantee Maps of Lancaster County and a Companion Scans of Township Warrantee Maps plus Current Road Overlay CD ($) are also available from Ancestor Tracks. They show precise outlines in metes and bounds of each original tract and all surrounding tracts in the township, giving the names of the warrantee and patentee; dates of the warrant, survey, and patent; and the patent and survey book and page of the recorded patent. Lancaster County USGenWeb Project This site contains several maps of Lancaster County both old and modern. In 1756, Colonel Armstrong recruited many Scotch-Irish men from Lancaster County. They attacked and destroyed the Indian village at Kittanning (present-day Armstrong County). Colonel Henry Bouquet led a group of Scotch-Irish men from Lancaster County to rescue Fort Pitt. They decisively defeated the Indians at the Battle of Bushy Run. Reverend John Elder, pastor of Derry and Paxtang churches, recruited Scotch-Irish rangers from his congregation in Lancaster County. Known as the Paxton Rangers or Paxton Boys, they provided security for white settlements between the Blue Mountains and the Susquehanna River. They are remembered for playing a prominent role in Pontiac's War. Local men served in the Lancaster County Militia. A guide at the Pennsylvania State Archives website identifies townships where specific companies recruited soldiers, see Revolutionary War Militia Battalions and Companies, Arranged by County. Lancaster County men also served in the 1st Pennsylvania Regiment,. Digital version at Family History Archive, the 5th Pennsylvania Regiment, and the 9th Pennsylvania Regiment. Pennsylvania Volunteers of the Civil War lists Lancaster County Pennsylvania Soldiers in the Civil War - Civil War Books, Rosters, Medal of Honor Recipients, and Soldier Biographies. Naturalization records can contain information about immigration and nativity. Prior to 1906, it is rare to find the town of origin in naturalization records. See Pennsylvania Naturalization for more information about the types of records and availability. Naturalizations granted at the county level were kept by the office of the Prothonotary. Naturalizations could also be granted on the Federal Court level. Mayhill, R., Lancaster County, Pennsylvania, deed abstracts and Revolutionary War oaths of allegiance: deed books "A" through "M", 1729 through ca.1770. At the back of Deed Book L are some Oaths of Allegiance. Abstracts in FamilySearch Catalog (For instructions see FamilySearch Catalog Place-name Search). Lancaster County, Pennsylvania Genealogy newspapers may contain genealogical value including obituaries, births, marriages, deaths, anniversaries, family gatherings, family travel, achievements, business notices, engagement information, and probate court proceedings. To access newspapers, contact public libraries, historical/genealogical societies, college or university libraries, or state archives in the area where the newspaper was published. Chronicling America Lancaster Daily Intelligencer 1863-1928 Lancaster, Pennsylvania. The Lancaster County Digitization Project is a consortium of institutions interested in digitizing the county's newspaper and manuscript collections. Several Lancaster county newspapers are provided in digital format through this and other collaborative efforts. PA-Roots Newspaper Articles for Lancaster County. Hawbaker, Gary T., Runaways, Rascals and Rogues:Missing Spouses, Servants and Slaves (Hershey, Pennsylvania:G.T. Habaker, c1987) At various libraries (WorldCat); FHL book 974.815 B38h Lancaster Journal, 1794-1810. Sometimes the fastest way of finding obituaries is to call or email the local public library in the area where the person died. If the library does not have newspapers, a librarian often will know where they are kept. If a death date is known, and the newspapers are at the library, someone on staff will usually make a search for a small fee, or will indicate someone who will do the search. PA-Roots Obituaries for Lancaster County. List of imported servants and transported convicts from Europe. Online at: Immigrant Servants Database. Includes list of imported servants and transported convicts who served labor terms in Colonial York County, Pennsylvania. The archives has historic records, such as wills and deeds from the beginning of the county in 1729. The Pennsylvania Archives collection contains county archive records that can be searched onsite. Currently the Archives' staff cannot provide research or make copies of these records. Their collections include Almshouse Registers; Tax records; Birth, Death and Marriage Indexes and Records; Midwife records; African American records; Wills; Deeds; Naturalizations; Coroner's inquests; and Orphan's Court dockets. A list of the Archive's county holdings are on Microfilm or Manuscript form. This site has church records and family histories that used to be at the Franklin and Marshall College Library. Has some genealogical data about College faculty, students and administrators only. All church records and family histories were moved to the Lancaster Theological Seminary in 1967 (see above). The archive has county records, manuscripts, newspapers, and more. Check the online finding aids, library catalog, Discovery Tool, and online newspapers and city directories. This is the official depository for records of the Atlantic Coast and Lancaster Conferences of the Mennonite Church. In addition, it has many records of other organizations affiliated with them. It also has helps for genealogists. The Library has thousands of historic books and magazines about railroads. The Archives has a large collection of photographs, maps, and manuscripts. Try their catalogs to see specific information. The Register of Wills and Clerk of Orphans' Court Office provides a variety of services to the public such as the probate of decedent estates, issuance of marriage licenses, collection of inheritance taxes and maintenance of records pertaining to adoptions, guardianships and estates. The Clerk of Courts maintains criminal records for the courts and the 519,000 plus citizens of Lancaster County. Many of the records are scanned. An online sight allows users to search records from 1729-1981 which requires you to sign in. Family history centers provide one-on-one assistance and free access to premium genealogical websites. In addition, many centers have free how-to genealogy classes. See family history center for more information. Search the online FHC directory for a nearby family history center.Family History Centers (FHCs) are branches of the Family History Library in Salt Lake City, Utah, and are located all over the world. Their goal is to provide resources for family history research. The main FHC for Lancaster County, Pennsylvania Genealogy is the Lancaster Pennsylvania Family History Center. For additional nearby Family History Centers, search online in the FHC directory. The Lancaster Public Library is part of the Lancaster Public Library System that serves 16 libraries. They have shared online catalog which has a sizable genealogy and biography collection. The library has historical and family records, maps, photographs, etc. Call ahead to make an appointment with a research librarian. The museum has three original log structures dating from 1750-1847, and a brick house dating to 1877. Tours explain Amish life and customs. Has historical documents relating to African American history. The cloister has a small research library that is open weekdays by appointment only. Limited genealogical materials are available. "The staff is unable to answer genealogical queries, but can provide some advice on available sources." For an appointment, call the Curator. This historical center has a library and archives with many records of genealogical value. Their collection contains over 15,000 volumes, as well as maps, family files, subject information files, photographs, oral histories, microfilm, and CDs. A reference collection consisting of indexes, genealogical and historical journals, and books is available for browsing. All other books are housed in closed stacks and must be requested at the reference desk. Lancaster city and county directories 1847-1922 and directories for several other Lancaster cities have been digitized and are available online. Has good information about U.S. Railroads, including a timeline.The museum also has a library and archives. The society has a research library, with an Online Search. The Family History Library has some of the journals they have published on microfilm. The society has an online catalog. Pre-1729 Eshelman, H. Frank. Assessment Lists and Other Manuscript Documents of Lancaster County Prior to 1729. Digitized by Internet Archive - free. 1750-1758, 1771-1772 Lancaster County, Pennsylvania Assessment Lists 1750, 1751, 1753, 1755, 1758, 1771, 1772 at PAGenWeb - free. 1751, 1756-1758 Lancaster County, Pennsylvania, Tax Lists 1751, 1756, 1757, 1758: With Additional Tax Lists and Index at FamilySearch Books Online - free. 1771-1773, 1779, 1782 Proprietary and State Tax Lists of the County of Lancaster: For the Years 1771, 1772, 1773, 1779 and 1782. (Pennsylvania Archives, Series 3, Vol. 17). Digital versions at Ancestry ($); Google Books - free. 1798 Pennsylvania, U.S. Direct Tax Lists, 1798 at Ancestry ($). The Salt Lake City Family History Library has microfilmed many Lancaster County taxation records, and they are available in Salt Lake City and can be accessed in its satellite Family History Centers. Vital records are handled by the County Orphans' Court. Between the years 1852-1855 Pennsylvania made a failed attempt to record birth, marriage and death events at the county level. While the records for that time period are available, there were few events recorded. County marriage records were kept in earnest in 1885. Births and deaths, at the county level, were begun in 1893 and kept through 1905. Abstracts and copies of vital records are available for some counties, but most are incomplete. For the most complete set of records, always contact the County Orphans' Court. 1852-1855 Lancaster County Birth Index 1852-1855 in International Genealogical Index at FamilySearch - free. Batch C535484. Early births 1893–1905 are located at the County Orphans' Court. See the heading Court Records on this page for contact information. 1726-1930 Pennsylvania, Births and Christenings, 1709-1950 - free index. Not complete for all years. This index is an electronic index for the years 1726 to 1930. It is not necessarily intended to index any specific set of records. This index is not complete for any particular place or region. This collection may include information previously published in the International Genealogical Index or Vital Records Index collections. 1852-1854 Pennsylvania Births Ancestry.com – $ Index with images. Old birth records for Lancaster County from 1881 through 1906 are kept by the Register of Wills. Pennsylvania marriages are located at the county level. Contact the Lancaster County, Pennsylvania clerk's office for marriage records from 2004 to the present. It is best to contact the Lancaster County Archives for marriage records prior to 2004. 1700-1821 Pennsylvania Marriage Records Ancestry.com – ($) This database is incomplete for all counties. 1725-1976 Pennsylvania, Marriages, 1709-1940 - free index. Not complete for all years. This index is not necessarily intended to index any specific set of records. This index is not complete for any particular place or region. This collection may include information previously published in the International Genealogical Index or Vital Records Index collections. 1730-1779 1,429 Marriage Records (1730-1779) of Rev. John Casper Stoever Pennsylvania/Maryland, at USGenWeb - Lists date of marriage as well as names and residences of bride and groom. 1767-1913 Pennsylvania, Marriages, 1709-1940 - free index. Not complete for all years. Marriage Licenses are recorded continuously from 1885 and an index are available on-line. Pre-1810 Pennsylvania Marriages Ancestry.com – ($) This database is incomplete for all counties. Includes 35,000 marriage records from vol. VIII of of the second series of the Pennsylvania Archives. 1852-1855, 1885 Lancaster County Marriage Index 1852-1855 and 1885 in International Genealogical Index at FamilySearch - free. 1852-1854 Pennsylvania Marriages Ancestry.com – ($) Index with images. 1885-1950 Pennsylvania County Marriage, 1885-1950 Extracted marriage records – free. Most of the records consist of marriage licenses, certificates, applications, docket books, and affidavits. This database is incomplete for all counties. May also contain marriage records earlier than 1885. Beginning 1948 The Register of Wills keeps a marriage index beginning 1948 with an online index. Divorce records are available through the office of the Prothonotary. The office of the Prothonotary is located in the courthouse building. Records may be obtained by visiting or writing. Early deaths 1893–1905 are located at the County Orphans' Court. See the heading Court Records on this page for contact information. 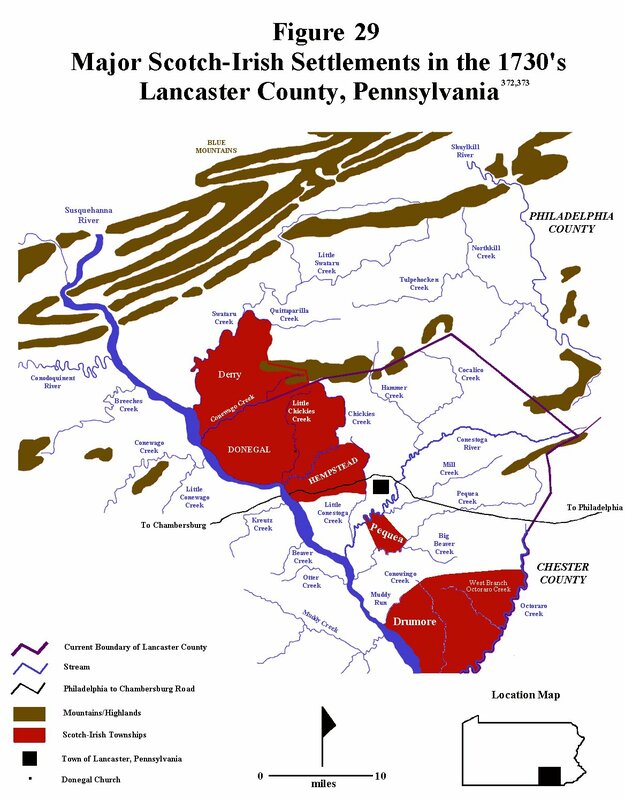 The Lancaster County PA GenWeb Project, has numerous maps, church records, local histories, family histories, and other genealogical and historical information for Lancaster county. FamilyHart Online Database This is an online family database containing over 843,000 records, mostly of Pennsylvania Dutch Extraction. Many of the families are from Lancaster County. This database adds 1,500 names per week which is updated online every quarter. It is the most comprehensive family database online for Pennsylvania Dutch families. Pennsylvania Dutch Family History, Genealogy, Culture and Life This site contains links to everything Pennsylvania Dutch with a large concentration in Lancaster County. ↑ Handybook for Genealogists: United States of America, 10th ed. (Draper, Utah: Everton Pub., 2002), Lancaster County, Pennsylvania. Page 588-593 At various libraries (WorldCat); FHL Book 973 D27e 2002; Alice Eichholz, ed. Ancestry’s Red Book: American State, County, and Town Sources, Third ed. (Provo, Utah: Ancestry, 2004), 579-581. ↑ Handybook for Genealogists: United States of America, 10th ed. (Draper, Utah: Everton Pub., 2002), [FHL book 973 D27e 2002]. ↑ Wikipedia contributors, "Lancaster County, Pennsylvania" in Wikipedia: the Free Encyclopedia at http://en.wikipedia.org/wiki/Lancaster_County,_Pennsylvania. ↑ Wayland F. Dunaway, The Scotch-Irish of Colonial Pennsylvania (Chapel Hill, N.C.: The University of North Carolina Press, 1944), 50. Free digital version at PA's Past: Digital Bookshelf at Penn State. ↑ 7.0 7.1 7.2 7.3 Philip Syng Physick Conner,"Registers of the Anglican Church in Pennsylvania prior to 1800," The Pennsylvania Magazine of History and Biography, Vol. 12 (1888):341-349. For free online access, see WeRelate. ↑ Wayland F. Dunaway, The Scotch-Irish of Colonial Pennsylvania (Chapel Hill, N.C.: The University of North Carolina Press, 1944), 52. Free digital version at PA's Past: Digital Bookshelf at Penn State. ↑ Wayland F. Dunaway, The Scotch-Irish of Colonial Pennsylvania (Chapel Hill, N.C.: The University of North Carolina Press, 1944), 53-54. Free digital version at PA's Past: Digital Bookshelf at Penn State. ↑ Genealogical Society of Utah, Parish and Vital Records List (July 1998). Microfiche. Digital version at https://www.familysearch.org/wiki/en/images/9/92/Igipennsylvaniaf.pdf. ↑ The Unified Judicial System of Pennsylvania http://www.pacourts.us/T/CommonPleas/ accessed 10 July 2012. ↑ Wayland F. Dunaway, The Scotch-Irish of Colonial Pennsylvania (Chapel Hill, N.C.: The University of North Carolina Press, 1944), 150-154. Free digital version at PA's Past: Digital Bookshelf at Penn State. ↑ Wikipedia contributors, "9th Pennsylvania Regiment," http://en.wikipedia.org/wiki/9th_Pennsylvania_Regiment, accessed 31 May 2012. ↑ Our thanks to FamilyHart at PAGenWeb for this link.